We have a very special guest here for Techie Tuesday! Marcy Kennedy — blogger, storyteller and writing instructor (and one of my fave online pals) — is here to talk about how to make Twitter a happier place for you. She’s got tricks to help you connect with the people you want to find online. People who share your interests and hobbies (aka tweeps who will be most interested in your book if you’re a writer). I hope you show her some love, and ask her some really great questions down in the comments section! I’m very excited that Jenny invited me here because she and I share the same social media happy place—Twitter! I hear a lot of people hating on Twitter and saying how it’s a waste of time. They claim they’re only able to connect to other writers not future readers, or that Twitter isn’t sending enough traffic to their blog to make it worth their time. Both of those things might be true for them, but they’re true because they’re doing it wrong. There. I said it. If Twitter isn’t yielding results, it’s probably user error and not a flaw with Twitter itself. Remember, Twitter is just a tool. You can’t complain that the screwdriver doesn’t work if you’re trying to use it like a hammer. For anyone who doesn’t know, a hashtag is the # sign plus a keyword. #MyWANA is a hashtag. #amwriting is a hashtag. So is #epicfail. When you put a hashtag at the end of your tweet, that tweet is now seen by everyone who’s watching that hashtag, not just the people who follow you. Using hashtags and creating a column in TweetDeck (or a stream in Hootsuite) to follow them can introduce you to a whole new group of people you’d never have met otherwise. I don’t have room in one post to tell you all the tricks, so I’ll just share one of my secret weapons. Hashtags.org gives you data that can help you find the places where people who might like your books hangout, when they’re most likely to be there, and a bunch of other great tidbits. I used the hashtag #startrek for our example. (Yes, I’m a nerd like that.) This trend graph shows you when that hashtag is most frequently used. 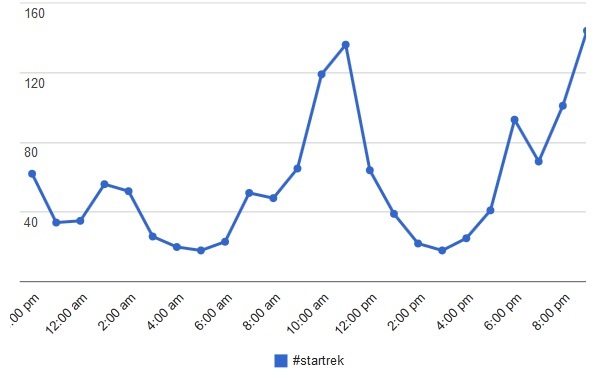 In just a quick glance, I can see that if I want to share a tweet about Star Trek and use that hashtag, the best time is going to be between 10 am and 11 am or after 8 pm at night. Hashtag.org also does some of the leg work for you in actually listing the people who are using this hashtag most often. This gives you people you can immediately check out on Twitter and see if you might want to follow them and interact because you already share a common interest. But here’s one of the best things. Hashtags.org provides suggestions for other similar hashtags that might work instead. You’re never going to be able to follow every possible hashtag, so by knowing the related hashtag, you can take a peek at them and then focus your attention on the one with the most people actively participating. And if you’re pinching your pennies like me and don’t want to pay for an upgraded account to see those top-rated related hashtag, I found a free alternative. Tagdef.com gives you related hashtags for free. They won’t rank them for you, but that’s okay because you’re going to look at them and pick the one that fits you best anyway. Or you could choose a few and alternate them. As you can see in the image below, Tagdef also has a drop down menu, so if you start typing a hashtag, it gives you suggestions for how you might finish it. This is priceless if you’re blanking on ideas. If you sign up for the Bronze, Silver, or Gold levels of Marcy’s A Growing Tweeter’s Guide to Twitter class and enter the code Marcy20, you’ll receive 20% off! If you can’t take the class in December, registration is already open for the January session as well. Also, Marcy forgot to mention she’s also teaching a 2-week class called Story in a Sentence: Creating Your Logline that starts December 1st. I would take any class from Marcy. Cause she rocks! Do you use Twitter? Do you like it? What do you like or dislike about it the most? Any questions you’d like to ask Marcy? Enquiring minds always want to know these things here at More Cowbell! Marcy is a fantasy writer who believes there’s always hope—sometimes you just have to dig a little harder to find it. In a world that can be dark and brutal and unfair, hope is one of our most powerful weapons. She writes novels that encourage people to keep fighting, to let them know that no one is beyond redemption, and that, in the end, good always wins. 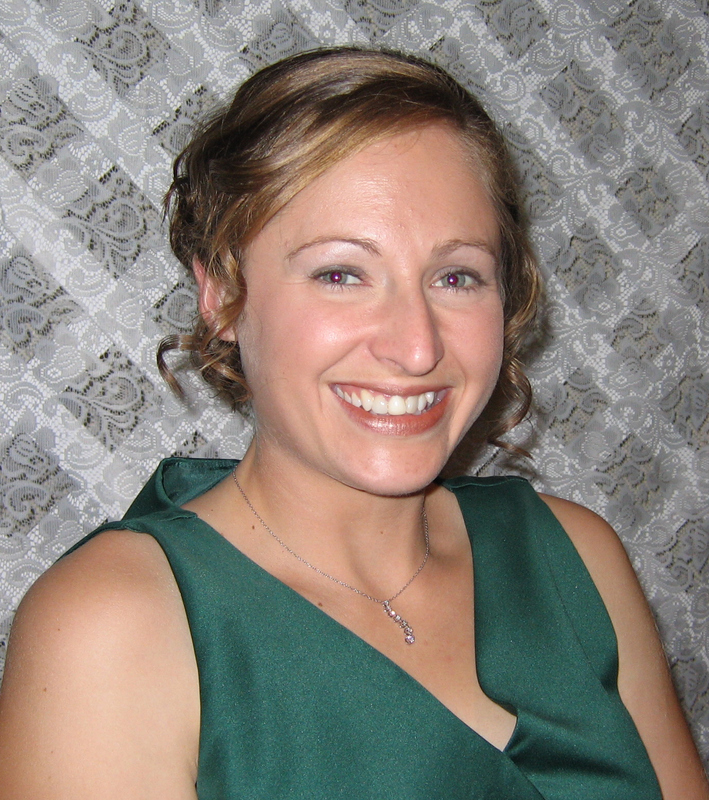 In addition to writing fiction, Marcy is a freelance writer and editor published across Canada and the U.S. She specializes in writing short non-fiction articles for magazines and newspapers and in editing for non-profits, small businesses, novelists, and non-fiction authors. This entry was posted in Blogging, Twitter and tagged author, Jenny Hansen, Marcy Kennedy, More Cowbell, Social Media. Bookmark the permalink. 104 Responses to 3 Hashtag Tips To Change Your Twitter from Drab to FAB! And this would be why I love both you and Marcy, Jenny! Two great places to find great places we need to be hanging out on Twitter. Score! Thank you so much for this information, Marcy! 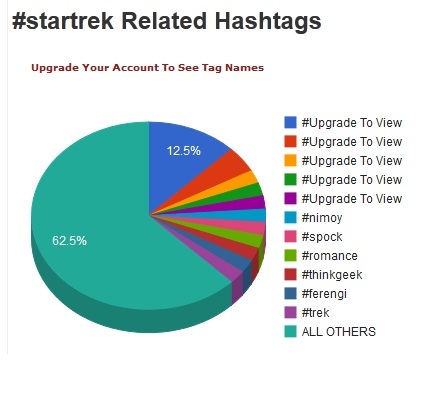 I’m loving the #romance up there with the #startrek pie. Who knew? I certainly never would have put them together, but it makes sense. I’m bookmarking both of these sites right now. You’re very welcome 🙂 I’ve had quite a few forehead-slapping “why didn’t I think of that” moments while using these services. Since I found them, I’ve started keeping a file so that I only have to look up a new hashtag once, and then I have the info handy for the next time. Awwwww….we love you too, Tameri! I have been experimenting with hashtags so I appreciate the input! Thanks ladies! Wow, I didn’t know there was so much to Twitter. What cool support sites! Thanks, Marcy! 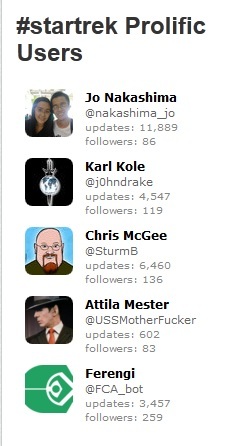 I *heart* Twitter, and thought I was a ‘master user’ (not capped on purpose) but these are super tools, Marcy! Thanks so much for the heads up! Going there now . . . Thank you for the compliment 😀 The good thing about hashtags is that it doesn’t matter where you put them in the tweet. You can add them at the end, after the link, and they’re just as effective without making the tweet hard to read. I love chatting it up with people. I find if we just make a personal connection before pushing our writing onto people, we are prone to get better results. While I still don’t think it is the easiest interface, I really like TweetDeck. I wish I knew how to better organize great reads for mash-ups, like @PiperBayard and @GeneLempp. Those two read a lot and really know how to spread the love. Great post Marcy! You’re so right–relationships and personal connections are key. Otherwise we’re going to be ignored no matter how many tricks we use. You’re a WANA International AI, aren’t you? If so, you can audit the class as well. Just send an email to Chad. Hahaha 😀 Leanne, you’re awesome! Just sayin’. Thanks to you and Gene for the sweet comments. Thank you so much for these tips, Marcy. Timing is important in Twitter and hashtag.org offers the perfect tool to make the most of your Tweets. And it’s great to know varied hashtags to reach new people. And to find new interesting people to talk to. Timing is key, especially if you’re like most of us and can’t be on Twitter all day long. Knowing the best time to be online and active can make a big difference in how many people we meet and how many people share our tweets. Now this is some awesome. I can’t wait to explore this new tool. You guys are the best. Thanks!! Thanks– but a question. (I rarely seek out/follow hashtags, so maybe I’m not the right audience). What’s your recommendation on using multiple hashtags? I see tweets that are more hashtags than contents, and they’re an immediate turnoff. Taking my Star Trek example above, since I know 10 am and 8 pm are peak times, I’d probably try to be on Twitter at those times and send out my tweet two separate times using different hashtags. That way I cover more ground without being hashtag heavy in my tweets. I love getting a tool I can use! This is great. Thanks, Marcy. Off to check out those sites. Awesome post! Thanks for the info, Marcy! I didn’t know about hashtags.org. I also didn’t know you shouldn’t have more than 3 hashtags. Not that I ever go over that, because that would take up too much space! But still, good to know. Excellent post! I was wondering if people putting # in front of a long list of words or very specific emotions/actions/ etc were actual hashtags (especially on FB) I’ve typed # in the tweetdeck’s search engine, looking for others to connect with that might share my interests, but its not been very productive. This is a great information, I will have to check it out. Thanks Marcy & Jenny. You brought up something really important–never, ever, ever use hashtags on Facebook. My co-writer is a Facebook guru (she did a guest post for Jenny as well not too long ago), and her head explodes when she sees people using hashtags on Facebook. Keep hashtags for use on Twitter or Google+. Very specific emotions or actions might be okay, depending on the hashtag, but usually those are added when people want to emphasize their point. They’re not actually useful as a hashtag per say because very few people have a column where they watch the #hate hashtag (for example). A hashtag that people aren’t watching is basically wasted space in your tweet. Hashtags.org is like a geek mecca. I’ve found so many hashtags I never would have thought of using. It was so funny at 10;50 because I thought In ten minutes I’m going to have to think of something to write with a #nature hashtag lol. Great information. Now I just have to find the time to actually use it! Ah, the time management issue. Think of it this way. If you spend just 5-10 minutes a week researching one hashtag, you’ll have a really strong pool to work with within just 6 weeks. Each hashtag you dig in to will yield many more great options. Actually it was such a good idea that I went ahead and put it on the next few posts I had written. Now I just have to make it a habit. What more can I say other than I LOVE YOU. This is great–I did not know about these sites! Two of my favorite people in one place! The good news for you (and for all YA writers) is that there’s a growing trend in teens using Twitter. Over Thanksgiving, my husband’s cousin was constantly checking Twitter and exclaiming “I have to tweet that!” The bad news is that since this is a change that’s happening, the teen communities are still in flux. Your best bet would be to brainstorm some topics that teens who would also be interested in your book might be chatting about. The more teens who come to Twitter, the more likely they are to find those established communities and take them over. There’s also a free PDF called “151 Hash Tags for YA Authors.” Because I’m not a YA author, I haven’t checked out the hashtags he suggests to see if they’re active, but the PDF might at least give you a good place to start. It’s not the tool, but how you use it. (I mean that in the most non-gutterish way.) Thanks, Marcy, for great tips. I await the day I can justify having my own hashtag. #sherryisaac. Hmm. Has a bit of a ring to it, don’t ya think? I may as well share it here. My Tweety Bird suffers from lack of attention. When Kristen Lamb wrote an article stating we should hang around to chat if we posted a comment, my brain did an ERK! She’s right, of course. If I simply bop out there to tell followers I read an awesome blog post, then disappear, it’s comparable to sticking my head into a party, nabbing a tasty treat and then leaving. So, I’ve let Twitter sit on the sidelines while I finish my WIP. If I can’t communicate properly and make the best use of it, I thought I should leave it caged. Jenny knows when I’m catching up on Tweets. She gets responses to tweets sent 10 or even 30 days prior. I could, I should download the Twitter feed to my iPhone. Well, you KNOW I’m going to be auditing this course!! Noted. Forgiven. On my list. I will take your course. Woo-hoo! Can’t wait to let Tweety Bird fly. I could barely finish reading the entire post, I’m so excited to check out these two new sites! Thanks, Marcy and Jenny – I am not new to Twitter, but I’m still a bit of an imbecile with it! 🙂 I’m quite anxious to try out these tips! Both of those sites are new to me thanks for the insight! Thanks so much, Jenny and Marcy. I’m going to check out these links! Isn’t Jenny’s blog awesome 🙂 I’m thrilled to be a part of it! *blushing* THANK YOU, ladies…you’re making my day. So first of all, I’ve been one of those people just dropping hashtag bombs all over the place having no idea if they even go anywhere or just into outer space never to be heard or seen from again. I had no idea there was a WEBSITE where one could check not only what hashtags to use but WHEN to send out the tweet. I mean…BRILLIANT!! Wow…that’s all I can say…I am definitely going to make much better use and am off to bookmark the sites as resources. Thanks soooo much Marcy and Jenny!!! Heading over to hashtag.org now. Thanks. Very helpful post, Marcy and Jenny. I write psychological suspense and blog about mental health issues (my brand). It just recently dawned on me that I should be using the #psychology and #mentalhealth hashtags. One of those head-desk moments! I think we’ve all had those moments 🙂 I hope knowing about these two sites will help us all have them a little less often. I love this post and your advice, Marcy! I will definitely be checking out the sites you shared and think they’re the most brilliant tool ever! It makes sense to watch what the most popular hashtags are for your genre. And best yet, it connects you to people you may have fun chatting with. I love being on Twitter during The Walking Dead because every episode they feature a new hashtag and all the fans come tweet together. I love it! My favorite has been #OneLeggedHerschel. Awesome! with this post, I can now RULE THE WORLD! Thanks so much for posting this, I only just started using twitter, facebook and wordpress for my writing career/thingy so your post arrived just in time! Thanks so much! With this post, I can RULE THE WORLD! Or at least that part of it that uses twitter. Excellent advice, Marcy! I used Twitter a lot and actually like it! Tweetdeck keeps things organized in such a way that even a technodork like me can use it effectively. Thanks SO much for the advice about just using two hashtags. I thought it was the more, the merrier. I’ll change my ways immediately! Jenny, you host the best parties! EXCELLENT!!!!!!! Post. Thanks so much, ladies. This info I plan to make serious use of! Love the #websites! Thanks for pointing out these excellent tools! I just searched a handful of hashtags I’ve used or at least know about, and I’m surprised (and yet, not) to find a few flat-lining… Wow. Thanks again! I love this! Thank you, Marcy and Jenny. I need all the help I can get on Twitter. I stare at all the comments and often run away. LOL. I need to find people speaking my language. Marcy, thank you for sharing those tips! I’ve got to see if I can take your Twitter class. I’m still mind-blown by your Story in a Sentence class–I highly recommend it to anyone out there! That is some fan-reakin-tastic information! I can’t wait to jump on Twitter and do it. Twitter has helped give me SOOO much more exposure than I would have had. Plus with friends like these, how can you go wrong? Jenny – thanks for another great post idea. Marcy Kennedy puts out a newsletter that is one of the only ones I read every time it shows up. Interesting stuff and she offers lots of valuable stuff. This article shows you what I mean. Kudos to Marcy. Okay, I know I found this late, but this is AWESOME! Thanks so much. I’ve never heard of this tool. I’ve a little Twitter-challenged, but I’m definitely going to look at this. Thanks!